The portable modular displays offered by Formax are a welcome alternative to bulky, heavy and costly displays. These engineering marvels start out very compact and then retract, unfold, or telescope into full-size exhibits. They’re self-contained and surprisingly lightweight, so they can be transported and set up easily…without the need for trucks, carts, or a team of workers. Plus, each Formax display is custom-printed with your company's message and vibrant design to increase visibility and grab attention in a crowded exhibition hall. Also, in addition to a very economical price, the compact size of a Formax display reduces the costs associated with its storage, transportation and set-up. To view our complete catalog, click here. 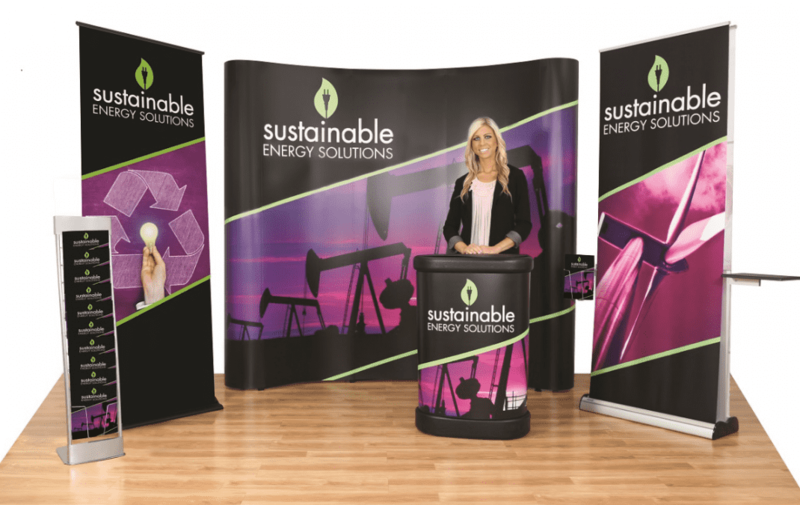 If you have any questions or would like more information about the tremendous benefits of custom-printed, portable Trade Show Displays, just give us a call at (314) 434-5500 or (866) 367-6221...or use the quick Contact Form or Quote Form at the bottom of this page. Do you have an upcoming Trade Show? Many industries hold periodic trade shows where exhibitors can showcase their latest products and services. Companies from all over the globe set up booths and exhibits to promote their offerings and develop valuable sales contacts. To attract visitors at a trade show, a company must have a display that is not only large and colorful (so the visitors see it) but also one that looks fresh, interesting and projects a professional image (so the visitors stop by). Some companies create booth displays from regular construction materials like wood and drywall. These take many man-hours to assemble before the show and to disassemble afterward. And since these “semi-permanent” displays are so bulky and heavy, they are difficult and expensive to transport. Transportation and set-up is never a problem with the displays offered by Formax. They are made from lightweight materials and take only minutes to set up.